Decorations change with times and tastes, but the basics remain the same. Evaluate the room you’re decorating for size and setup, then select your pieces working from large Halloween decorations down to the accents. Be sure to incorporate Halloween party supplies that are new for 2012 as well as those that are just new boo to you! Your choices in decorating walls range from fabrics to patterned papers to murals. Think about covering the wall that stands opposite the entrance, and placing free-standing Halloween decorations in front of it for depth. One setup we like this year is to hang a Cemetery Gates illustration in the largest size the wall (and your budget) allows, and placing a pair of zombie silhouettes or tombstones in front of it. Silhouettes work even in a smaller room – some might eat brains but never a lot of precious floor space! Experiment with different illustrations and silhouettes. Another spot for a large decoration is the main entrance. For 2012 we like a spider web door topper/entrance or a five-foot corex lighted skull from our collection of outdoor Halloween decorations. Keep in mind that just because something is tough enough to withstand October weather doesn’t mean it can’t be used indoors! Think about using them on the inside of the doorway so guests can enjoy them all evening long. If your space is large enough, you’ll want a large decoration right in the center that everyone can see from anywhere in the room. This could be a chandelier or other large hanging decoration, a large free-standing decoration, or both. We really like trees for Halloween 2012 because there is such a wonderful selection of styles and materials, and sizes go all the way to the magnificent Spooky Balloon Tree from Halloween Props that is 8’X8’ when fully assembled. You can incorporate trees into smaller spaces as well. Just choose skinnier trees, put them in corners or flank doorways with them. A Halloween party is one of the events where we usually are looking to provide subdued and/or flickering lighting. 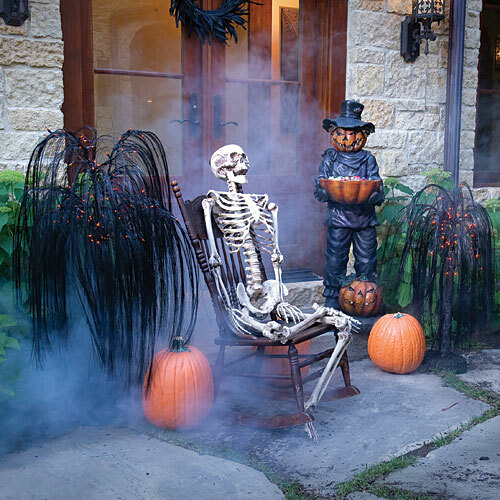 Find Halloween-themed lanterns, string lights and a darling lighted ghost (which would look terrific in a grouping with one of the above-mentioned trees) in Halloween Lights, but do visit Boo-tique for some imposing and deliciously creepy tabletop candelabra, too. Finish the rest of your walls and windows with cutouts, garland, or drapes of spider-patterned gossamer. Try to incorporate little surprises into your decorating, such as customized bottle labels that coordinate with the décor, or radiant balloon lights (which cannot be seen in black balloons, but work fine with other colors of latex balloons). Getting ready for Halloween doesn’t have to be stressful. There are plenty of simple, low-maintenance ways to create tasty party snacks and eye-catching tableware. Halloween doesn’t have to be scary, and it can easily be made into a holiday with elegant style. Candle holders like pumpkin lantern centerpieces jazz up orange or black tablecloths. Sprinkle candy corn around for edible decorations to add colorful snacks for hungry visitors. If candy corn won’t fix your craving for Halloween goodness, make cakes in mini pumpkins cake pans. Decorate with orange and green icing, and watch your table come to life. Create faces on party tableware! Smiling jack-o-lanterns, happy spiders, laughing vampires- there are many kid-friendly snacks and tableware to keep the atmosphere light. A boo bash party pack can jazz up any boring table at Halloween. For the child with a sweet tooth, bake some sugar cookies in the shapes of pumpkins or candy corns and decorate with icing. For the child who wants something healthy, create an array of black and orange fruits and vegetables like carrots, blackberries, oranges, mangos and raisins. The combination of funny Halloween characters and kid-friendly snacks will create a simple spread that children of all ages will love! Orange and black not your thing? Spice up a spread with a simple Halloween vampire theme of red, black and white. Have your main centerpiece be a haunting, tabletop skull candle holder that looks like it was taken from Dracula’s dining room table. Any vampire fan will love sinking his or her teeth into cupcakes wrapped in vampire cupcake wrappers. Don’t forget to choose some sort of red beverage to go along with the treats. There are lots of vampire goodies out at Halloween time that can serve as secondary table decorations, like plastic fangs and bats. The chills and frills party pack look is big in Hollywood and can be a real hit for your Halloween spread. Aside from fun, disposable cups, plates and napkins, there are lots of exciting table centerpieces like plastic or glass skulls. If you’re interested in having your Halloween snacks fit in with the theme of the table, create brains oozing from skulls from nomskulls cupcake molds. It’s up to you how scary you want to get. Skulls can be a super spooky theme to a Halloween table spread or just a fun, colorful way to jazz up a table. After you set your Halloween table, try these Halloween party recipes and enjoy the fun of pre-party preparations with family and friends. We are pleased to show you our new 3-D Mini Pumpkins Cake Pan, which will be ready to ship July 15! Each pan will bake 4 pumpkin tops and 4 bottoms at one time. When baked and cooled, “glue” tops and bottoms together with a thin layer of icing. Embellish these adorable pumpkins with green and orange icing and serve them by themselves or with spider cupcakes “hiding” among them! The spiders are always a hit at parties but labor-intensive. We recommend recruiting help with decorating, or setting part of the batch aside for a simpler treatment. Bake cupcakes according to package directions. While they are baking and/or cooling, trim licorice for legs and cut marshmallows in half for the spiders’ heads. To assemble, spread a thin layer of frosting on the cut side of a marshmallow half. Place the marshmallow on the top of the cupcake near the edge, frosted side down, as the head. Frost the rest of the marshmallow and top of cupcake. Drop chocolate sprinkles all over, then place candies on the head as eyes. Poke pieces of licorice into the top, on either side of the head, as legs. Nothing beats our Sweet Station-Halloween for displaying and serving your creations! We hope you enjoy the new cake pan and the recipe! For more pumpkins, spiders and other ideas for your Halloween table, shop ShindigZ Party’s Halloween pages.